How do you want to inspire your team? Do you want to bring them up to Lake Tahoe for an experience that they'll never forget? If you answered yes, Granlibakken Tahoe is the place for you. 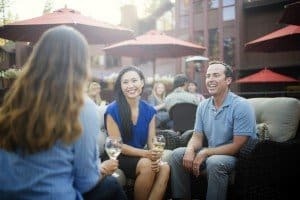 With 24,000 square feet of flexible meeting space, plenty of amenities onsite, and affordable all-inclusive conference packages, Granlibakken is the perfect setting for your Tahoe business retreat or event. Granlibakken's all-inclusive conference packages include all meals cooked by an award-winning kitchen staff, access to indoor and outdoor meeting space, accommodations onsite, and access to the many amenities that Granlibakken has to offer. The Treetop Adventure Park is located onsite, and is the perfect place to challenge your team while completing a series of aerial trekking courses. Granlibakken Tahoe has its own ski and sled hill onsite, which offers fun for all ages. After a day of sledding, warm up at our fire-pit with s'mores, the perfect activity to socialize with your team and enjoy a nostalgic treat. The meeting space at Granlibakken can be suited to fit your needs. Our Mountain Ballroom can accommodate up to 400 attendees, and there is also a number of options for smaller break-out rooms, and space for poster sessions. Our in-house audio/visual team will make sure that all of the equipment that you need is provided, and our banquets staff and events coordinators are always happy to accommodate requests and to make your business meeting a success. Granlibakken's outdoor spaces also inspire connections, with fire-pits, barbecue areas, and grassy lawns available to groups. Accommodations for up to 400 people are available onsite at Granlibakken Tahoe. With a variety of lodging types, from standard bedrooms to townhomes, Granlibakken's accommodations will ensure that everyone is comfortable during their stay. The many amenities included for conference guests include resort-wide wireless access, parking, access to our heated pool, hot tub, and sauna, access to our five tennis courts, half-priced skiing and sledding day passes at Granlibakken's ski and sled hill, and access to miles of hiking, biking, and walking trails. Host a memorable conference in Tahoe this year at Granlibakken Tahoe. Our conference center and our conference staff will be sure to impress, and your next retreat will be unforgettable.